Naked puts are single contract strategies and are also referred to as Short puts, they involve selling or writing an option to buy a Put Option for a given Strike Price. 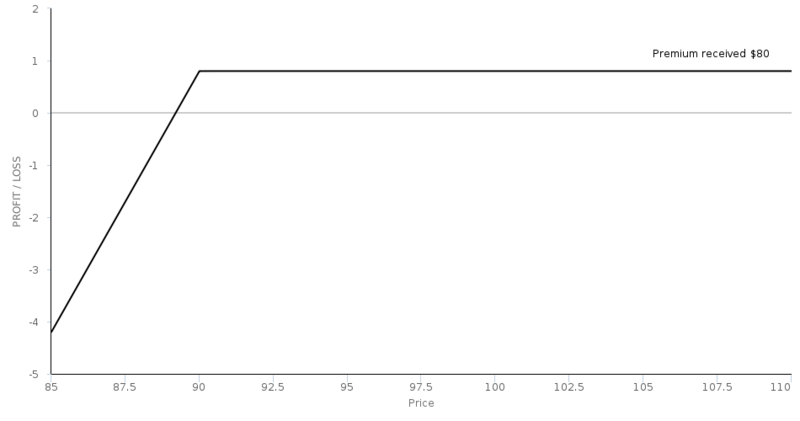 The Put Writer is paid a Premium for the option and is taking the view that the market price will be above the Strike Price. Naked calls are therefore slightly Bullish or positive about the prospects for the Underlying asset or commodity. If the price of the asset or commodity falls below the Strike Price before Expiration, the Option Writer will be assigned and obliged to buy from the option contract holder the Underlying asset or commodity at the Strike Price, even though is far higher than the market price. The potential differential between the Strike Price and the market price upon Expiration is where the Option Writer is most exposed to risk with selling puts. Naked puts have undefined risk because the price of the Underlying can fall all the way to zero. Although that does make them implicitly lower risk that naked calls, the price of an Underlying asset will typically fall far faster and more steeply than it will rise as investors try to dump falling stocks or commodities. Naked puts can be used as a strategy to acquire a position in a given asset at a lower cost basis. If the put seller was going to buy the stock anyway then the Premium received reduces the overall expenditure incurred. This is sometimes referred to as a selling cash-secured puts because although the option is written naked, the put writer has the funds to pay for the stock at the Strike Price if they are subsequently assigned. A further strategy is put credit Spreads where the put writer will also buy a put at a lower Strike Price to cap or define their risk. XYZ is trading at 100.